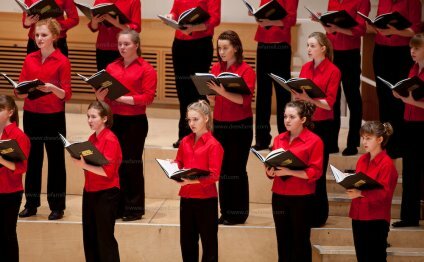 (NYCoS) is a choir for young singers in Scotland, founded in 1996. It is now one of four national choirs: The National Youth Choir of Scotland, NYCoS Training Choir, National Boys Choir and National Girls Choir, in addition to 14 Area Choirs, an educational remit and a range of music publications, CDs and resources. NYCoS has been led by Artistic Director Christopher Bell since its formation. The choirs have sung arrangements and original pieces by Scottish and international composers including Eric Whitacre, Poulenc, Bernstein, Britten and Ken Johnston. Entry is by audition for singers aged 16 – 25 years. The basis of the choirs activities stem from a residential week in the summer, followed by concerts in Scottish cities. They have toured to Ireland (2000), Sweden (2001), USA (2004), Hungary (2007), Germany (2010), and to Austria, Czech Republic and Slovakia (2013). NYCoS Training Choir, formed in 1997 and currently directed by Michael Kibblewhite, trains singers aged 16 – 19 who need more experience in a wider repertoire, and receive vocal and choral and individual coaching. Entry is by audition and the members of Training Choir share the residential course and some of the Scottish concerts with NYCoS. The National Boys Choir was formed in 2002 for boys with unchanged and changed voices. Entry is by audition and is open for boys aged 10 – 15. Structured in three sections, Junior Corps, NBC and Changed Voices, the choir meets annually around Easter time for a residential course, followed by concerts. The choir has performed in Belfast, Edinburgh, Glasgow, Linlithgow, Londonderry, Paisley and Stirling. In 2007, NBC toured to Kendal and Dumfries giving concerts in Kendal Town Hall and the Crichton Church in Dumfries. The Choir has a repertoire including classical, sacred and Scots songs. Recent commissions include Tom Cunningham's Saga of the Seven Days and Sheena Phillips Sea Shanties. The National Girls Choir was formed in 2007. 80 singers between the ages of 12 and 16 were selected by audition from Scotland. The daily timetable was a mixture of vocal coaching, musicianship training and full choir rehearsals. They performed their first concert in the Queen's Hall in Edinburgh in April 2007. In 2010, the choir formed another section, the National Girls Training Choir. It offers girls who audition successfully, but whose voices are not yet ready for National Girls Choir, places on the National Girls Choir course. In 1998 NYCoS formed two Children's Choirs (now known as Area Choirs), one in Livingston, West Lothian and one in Edinburgh. Each choir had approximately 60 members. Members were recruited from Primary 3 pupils (with some Primary 4 to make up numbers). Both choirs met for one hour each week and members received musicianship training for 30 minutes and sang as a choir for the remaining 30 minutes. At present there are 14 Area Choirs: Aberdeen, Angus, Dumfries, Dundee, East Dunbartonshire, Edinburgh, Falkirk, Inverness, Isle of Lewis, Midlothian, Perth, Renfrewshire, Stirling and West Lothian - with a membership of over 2, 000 children. The set-up of the Area Choirs is still the same with members receiving musicianship training and singing as a choir. End of term concerts are given at Christmas and Summer. NYCoS has an educational remit and runs Kodály Musicianship Training weekends for teachers, choir directors and music specialists. They run in-service days and singing workshops for schools. They also run Mini Music Makers classes across Scotland, which are musical sessions designed to introduce babies, toddlers and nursery age children and their parent/carer to music.